Faubion United Methodist Church is located in the heart of Gladstone, Missouri and has been at its present location since 1870. It is one of the oldest churches in the Kansas City Metro area, having been established in 1837. We are members of the Northwest District of the Missouri Conference of the United Methodist Church and governed by the United Methodist Book of Discipline. Below you will see two links, one relating to the history of our church and one relating to the committees that govern our church and its activities, as well as listing members of those committees. Clicking on the button will take you to the relevant information. Faubion Chapel was organized in the mid 1800’s by Jacob Faubion (1785-1852), a minister of the gospel. 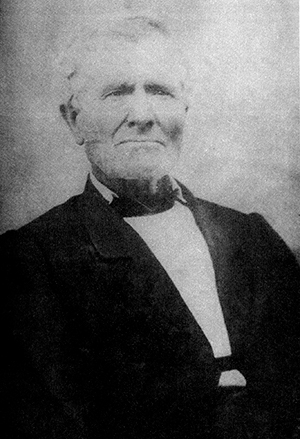 Jacob was born in Fauquier County, Virginia, and moved to Clay County, Missouri with his family and approximately thirty other families in 1832. They all settled in the same general area and became the first congregation in 1837-1838. For the first few years, the congregation evidently met in various settlers’ homes. The first building was constructed in 1850 on the corner of N.E. 72nd Street and North Highland in what is now Gladstone, Missouri. On January 30, 1865, for the sum of $5.00, a contract was drawn up between Napoleon B and Sarah (Jacob Faubion’s daughter) Thomas and the church trustees (William Faubion, John Broadhurst, S.K. Hopewell, John Faubion, Logan Darby, Jacob Broadhurst and Levi M. Gillispie) for a tract of land. This deed was recorded on March 1, 1852. On March 23, 1870, a contract was drawn up and signed the following day between William B. and Marium Faubion and the church trustees (William Faubion, John Broadhurst and Ephrium Broadhurst) for the sum of $100.00 for a tract of land that is now the corner of N.E. 72nd Street and N. Troost and is the present site of the church. The church was then built on this site for a sum of $2,500.00 and was called Faubion Chapel. Attendance in the early years of the church was good. Large families from miles around attended services and social events. It was the main gathering place for farm youth. Little is known or recorded about events in the later years of the 19th century or the early 20th century. However, by the 1920’s, all this had changed. The early families had scattered. Many of the younger people were turning to urban living in the growing city to the south, Kansas City, Missouri, and the lovely little church was threatened to be one of the many whose doors were being closed. In September, 1935 (Annual Conferences were then held in the Fall), Rev. Russell J. Faubion was appointed to the Faubion congregation. With a half dozen or so persons attending, and little hope for the future, he was to bring about the closing of the church. However he could not bring himself to tell the tiny congregation the bad news and kept putting it off from Sunday to Sunday. By the 1940’s, the attendance had slowly improved. The half dozen had become a dozen, and then twenty or more. Relocation of the church was discussed through several minister’s pastorates, but was consistently voted down by the congregation. The original church building, which was built in 1870 for $2,500.00, stood until 1965 and was called Faubion Chapel Methodist Church South. With the denomination’s union in 1939, the word “South” was dropped from the name. 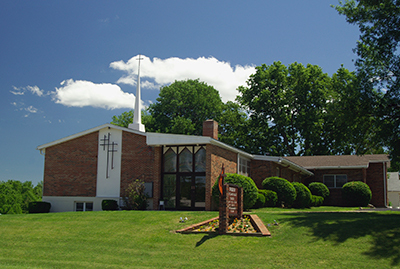 When the denomination merged with the United Brethren Church in 1968, the church became Faubion United Methodist Church. The word “Chapel” had been dropped from the name sometime earlier. In 1949, a basement was built east of the present church. It was originally planed for a parsonage, but became much needed Sunday School space instead. Still more space was needed, so about 1957, a basement was built beside the original building and the old basement removed. The present sanctuary was built over this basement and consecrated for worship in December 1966. A new parsonage was built at 1601 N.E. 72nd Street in June 1962. This dwelling was sold in 1979. The present parsonage at 1908 N.E. 72nd terrace was purchased in 1983. 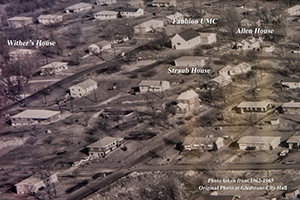 In the 1960’s, the City of Gladstone, Missouri, was a thriving suburban community. The church grew rapidly and more classroom space was needed. However, the congregation was heavily indebted for the sanctuary and new parsonage and there seemed to be little hope for adding space in the near future. In the summer of 1963, a along-time member of the church, Granville Egbert Broadhurst, passed away. Because of this love for the church, he included the church in his will, leaving the church $12,000.00. In terms of money it was not great, but is terms of inspiration, it encouraged the congregation to complete the church plant. An effort was made to reduce the mortgage and plans were drawn for a 15 room educational building and conference room adjoining the sanctuary. In the Fall of 1965, the original church building was razed and the much needed educational building started. The entire facility, as it now stands, was opened in April 1966. Later two rooms were remodeled for a pastor's study and church office. The small congregation, through the inspiration given by an old-time member, had been able to add a two story, 100 x 40-foot education building, completely furnish it, as well as remodel the sanctuary and completely furnish it with carpeting, pews, organ and air conditioning. Out of gratitude to Mr. Broadhurst, the educational build was named the Broadhurst Memorial Education Building. On September 27, 1970, the congregation celebrated its centennial with special worship services and various festivities. Present for the occasion was Bishop Eugene M. Frank, episcopal leader of the Missouri Area of the United Methodist Church. During these years, the church had two worship services on Sunday mornings, as well as Sunday School. Part of the events of this celebration was a special “Old Fashion Prayer Meeting” and a potluck with the women of the church dressed in clothes of the 1870’s. In 1974, there was a need for weekday education of preschool-age children. The pre-school program was begun and by 1984 was teaching 86 children of 3 and 4-year-old range in three morning and two afternoon sessions per week. This pre-school was highly rated in the northland and continued in operation for 40 years, closing in 2014. In 1975, the church through its Committee on Christian Missions began an all-church food pantry on the first Sunday of each month. These collections of food were distrusted to needy families in the area. The project has continued to present day with the church supporting several local charitable organizations including Harvesters and Love, Inc.
On November 25, 1979, the mortgage for the church was burned in a special service at which Bishop Robert E. Goodrich of the Missouri Area preached. Also in 1979, through the guidance of a pastor’s wife, Ruth Whitney, a group of church members started to design and construct a series of stained glass windows for the sanctuary. The final window of the initial project was completed in 1984. Since that time, additional windows have been constructed for windows during an addition added in 2006. Every stained glass window in the church was handmade by church members. 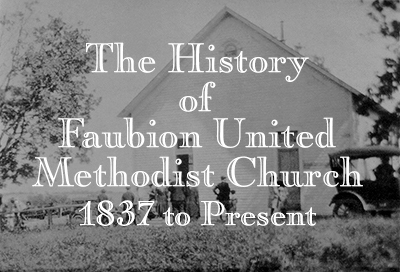 Throughout the rest of 1900’s, Faubion United Methodist Church continued to minister to the local community. In the early 2000’s, it became clear that additional space was needed in the narthex for an elevator from the lower floor and parking lot. After numerous planning sessions and fund-raisers, a groundbreaking ceremony was held on June 19, 2005. Much of the construction was completed by members of the congregation. The addition was dedicated on September 17, 2006. On May 5, 2012, with many former pastors and members in attendance, the church celebrated its 175th anniversary. In 2013, the church was the beneficiary of a significant donation from the wills of Mr. and Mrs. Guillenwater, longtime members of the church. As a result, on June 30, 2013, the mortgage for the addition was burned and the church once again became totally debt free. 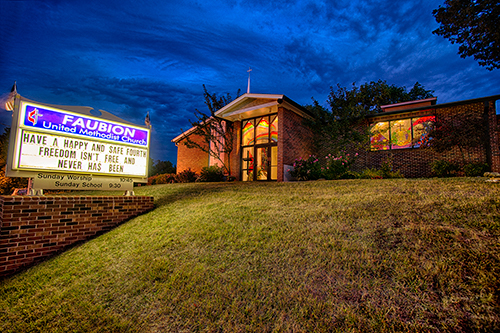 Today, Faubion United Methodist Church remains a viable and important part in the lives of its congregation and the community. As we move forward, we have joined the “Baby Grace” ministry designed to help young mothers and children who are struggling with day to day needs. In addition, we continue to actively support local charitable organizations and food banks. The congregation believes that the coming years will bring further opportunities to expand our ministries and bring God’s grace to our community. Our church has a long tradition of being open to all who wish to join in learning more about God and our Savior. We continue that tradition to this day. The governing body of the Church is the Administrative Council and is made up of the chairperson from each church committee and several at large members. It meets in the Fellowship Hall on the 2nd Monday of every month at 7:00 PM. Everyone is invited to attend and participate, however, per the Discipline, only elected members of the Administrative Council are authorized to vote on church issues. If you would like to serve on a committee, please contact the chairperson of that committee or Pastor Steve Elkins. If have questions and/or concerns relating to a particular issue, please contact Pastor Steve Elkins or any member of the committee responsible for that area of our church life. They can be contacted by calling the church (816-436-1882), by email (faubionumc@hotmail.com), or by talking to them at church.